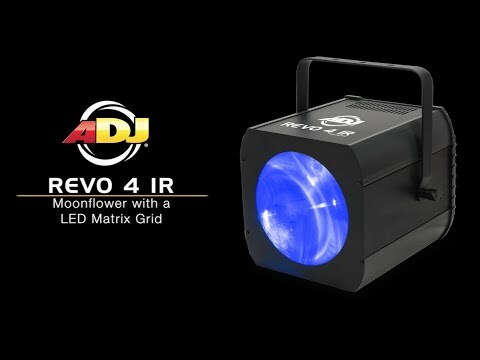 One of ADJ most popular Moonflower effects, the Revo 4 IR now includes wireless control options compatible with the UC-IR and Airsteam IR remotes (sold separately). The Revo 4 IR produces a matrix grid of 256 LEDs that creates dozens of different patterns as the red, green, blue and white LEDs are turned on and off and kick up the excitement for any type of party with or without the use of fog. The rear panel features a 4-button LED menu display, 3-pin DMX in/Out to link units together and IEC power In/Out to daisy chain the power from one fixture to another. 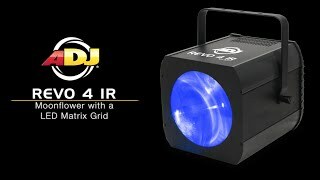 Considering purchasing the American DJ Revo 4 IR? Have questions? Ask people who've recently bought one. Do you own the American DJ Revo 4 IR? Why not write a review based on your experience with it. Really handy little light for those venues where you need to light up the dance floor with coloured gobo's. Great for the price to be honest, its not trying to be something its not! Bought two of these last week, all I can say is it's the best purchase iv made for a while. They give a cracking show when you link them together in master/slave mode. Bought this light last week and well impressed with it. Its sound to light with lots of sequences though at mode 0, it cycles through everything and does its own thing. Good buy! A great light. Nice and bright a good replacement for 2 smaller moonflowers i previously had. Seen a video for American DJ Revo 4 IR online or have you own video? Check out American DJ Revo 4 IR on DJkit.com!